Netflix’ documentary “Fyre: The Greatest Party that Never Happened” is quite similar to the actual Fyre Festival in that both were receiving lots of positive attention and each turned out to be disappointments. “Fyre” details the events of the failed Fyre Festival, a luxury music festival that was supposed to take place in the Bahamas in April and May of 2017, organized by rapper Ja Rule and former entrepreneur Bill McFarland, in order to promote McFarland’s music booking app. The topic of the documentary is an interesting one to cover, and probably one that a lot of people do not know about. 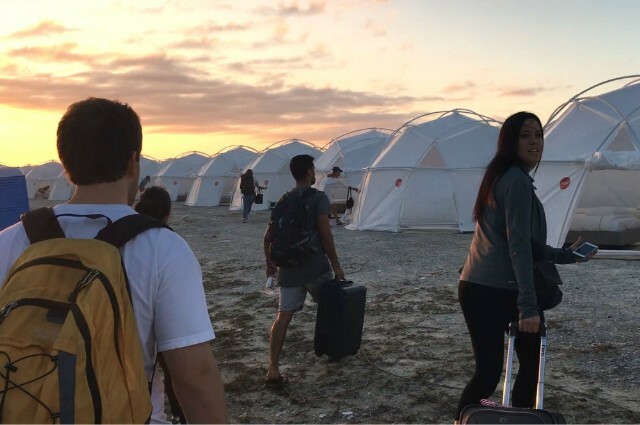 Sure, people may have had an underlying sense of the story when it came out, but “Fyre” does delve deeper into the colossal fiasco that was supposed to be the Woodstock of the 21st Century. That is where the problems come in, though. The topic is interesting, but the documentary flounders with this due to mild explanations and not enough interview subjects. There are multiple points throughout the documentary where things feel under-explained, and it becomes hard to focus on other details that “Fyre” is providing because one is wondering about an aspect that was brought up earlier. For example, the documentary quickly glosses over the music booking app, which seems like a completely illogical idea that no musician would actually agree to partner up with, and that gnaws on the viewer as they try to take in the other information that is offered. The information that is offered also feels underwhelming, as the majority of interviewees are people who worked for McFarland, some of which were not even involved in planning the actual festival, and they essentially all have the same story: McFarland took on a job he really could not handle, screwed things up and hurt them in the process. There is only one person who actually attended the festival who gets talked to, and one group of people in the story who are somehow completely left out of the interview process are the models who were hired to hype the festival. One of the first things that “Fyre” shows the audience is McFarland and Ja Rule hiring models to act as influencers for the festival. It would have been interesting to hear from some of them, as they were hired to promote the music festival, thus ruining their credibility when the entire thing turned out to be a disaster, and yet not a single one was spoken to. In the end, the most interesting part of the documentary is not the focus on the unmitigated disaster that was the Fyre music festival, but Billy McFarland’s career. Before Fyre, he created a kind of credit card known as Magnises, which was supposed to get users special perks. After the Fyre festival, it details how McFarland turned to creating a business that was selling fake exclusive passes for high-profile events, such as award ceremonies and fashion shows, to the people who attended his festival, thus attempting to scam the same group of people twice. The issue with this is that while the topic of McFarland’s career and inevitable downfall as his scams and grifts catch up with him is interesting and entertaining in a schadenfreude type of way, this is only an element to the larger story that “Fyre” is trying to tell. On top of that, it is only about twenty minutes of the runtime, so there is not enough of it to improve the documentary as a whole. “Fyre” has the makings of an interesting documentary, but with not enough substance for its main focus and getting completely overshadowed by a more minor aspect of the Fyre festival fiasco story, the documentary ends up feeling dull.